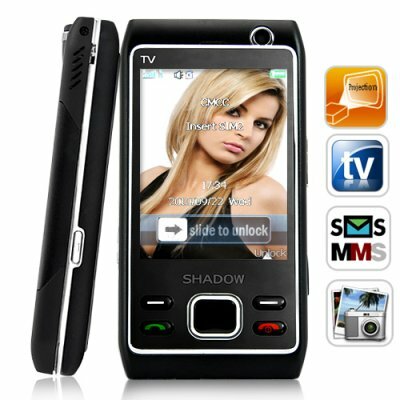 Successfully Added ShadowMax - Mini Projector Cellphone (Quadband, Dual-SIM, TV) to your Shopping Cart. A first class mini projector with up to 50 inches of wall-projected amazingness! A top of the line quad band, dual SIM touchscreen phone. Brought together in one amazing device - say hello to the brand new ShadowMax - Mini Projector Phone! Also comes with a free 2GB microSD card! Perfect Projector: Why would you want a projector that fits comfortably in the palm of your hand? In a word - convenience. The convenience to watch your video files at any time, but not on a little, wittle, teenie, weenie, pansy screen, but on 50 inches of wall projected glory...that's how good movies should be watched! Better yet, use The ShadowMax for on the go or on the fly presentations. Picture This: You're in the elevator. It opens on the 11th floor and in steps Bill Gates. It just so happens you have the video you made for your dotcom startup. Without missing a beat, you play the video file and project it against the elevator wall. Fast forward two weeks later, the world's richest man is writing you a check for $10,000,000! Perfect Phone: You're a man of the world and you need a phone that goes global whenever you do - The ShadowMax Mini Projector Cellphone with quadband GSM functionality does that and more. It's unlocked so simply insert a prepaid GSM sim card into the phone and you can start dialing or receiving calls..in fact, since The ShadowMax is also a dual-SIM cellphone, you can insert 2 SIM cards. In plain English? One. Cell. Phone. Two. Phone. Numbers. Let's see the iPhone do that! Perfect Pheatures: It only gets better. To make The ShadowMax even more tres cool and oh so functional we've put in a front and rear facing camera, MP3 and MP4 player, a host of productivity tools, and even analog TV! The ShadowMax - Mini Projector Chinese Cellphone, super-charged with everything you need for your modern life. Brought to you by the leader in Chinese cellphones - Chinavasion. No, this phone is better than the iPhone! Unlike the iPhone, the Galaxia Phone comes fully unlocked and ready for use with any network or carrier straight out of the box. You do not need to use any firmware hacks and risk "bricking" the phone. The ShadowMax Phone also has dual SIM, Micro SD slot, video recording functionality and a lot more (unlike the iPhone).